Candy Quick Order. 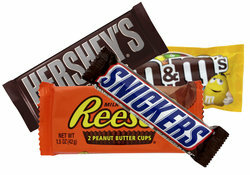 We carry the most popular candy bars in the world. Reeses Peanut Butter Cups, M&M Plain and M&M Peanut, Hershey's Almond, and More. Enjoy! Available for Delivery in Atlanta, GA ONLY.